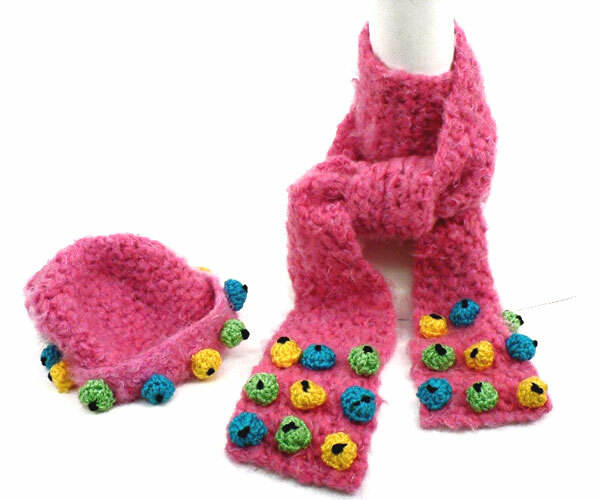 Crochet a colorful cold-weather set for you or your children with this Bobble Scarf and Hat set. Embellished with colorful bobbles and worked up with brightly-colored yarn, this winter accessory set is great for kids and adults of all ages! This set would also make a wonderful gift for a little girl or boy (just change the yarn colors to make it suitable for a boy). This is a fun and easy crochet project that you'll have so much fun making! Scarf: In pattern stitch, using US K-10.5 (6.5mm hook), 12 sts and 12 rows = 4"/10 cm. Hat: In pattern stitch, using US J-10 (6mm) hook, 13 sts and 13 rows = 4"/10 cm. sc3tog: Single crochet 3 together – Insert hook in next stitch, yarn over and pull up a loop, (two loops on hook), [insert hook in next stitch, yarn over and pull up a loop] twice (four loops on hook), yarn over and draw through all four loops on hook. With larger hook and MC, chain 14. Row 1: Sc in second ch from hook and in each remaining ch across, turn—13 sc. Row 2: Ch 1, sc in first sc, *ch 1, skip next sc, sc in next sc; repeat from * across, turn—7 sc and 6 ch-1 spaces. Row 3: Ch 1, sc in first sc, sc in next ch-1 space, *ch 1, skip next sc, sc in next ch-1 space; repeat from * across to last sc, sc in last sc, turn—8 sc and 5 ch-1 spaces. Row 4: Ch 1, sc in first sc, *ch 1, skip next sc, sc in next ch-1 space; repeat from * across to last 2 sc, ch 1, skip next sc, sc in last sc, turn—7 sc and 6 ch-1 spaces. Repeat Rows 3 and 4 until piece measures 74"/188 cm or desired length. Fasten off. Beginning at center of bobble, with smaller hook, ch 4, leaving a 4"/10 cm tail for tying bobble to scarf. Round 1: Work 9 dc in 4th ch from hook; join with slip st in top of beginning ch—9 dc (beginning ch does not count as a stitch). Round 2: Ch 1, [sc3tog] 3 times; join with slip st in beginning ch. Fasten off leaving a 4"/10 cm tail for tying bobble to scarf. Using yarn needle and D, work a French Knot at the center of each bobble. Stuff each bobble lightly with polyester fiberfill. Arrange 9 bobbles, in 3 rows of 3 bobbles each, over the last 5"/12.5 cm of each end of the scarf. Use the yarn tails to tie the bobbles to the scarf. Weave the tails back into the bobbles to hide. With larger hook and MC, chain 2. Round 1: Work 8 sc in second ch from hook; do not join—8 sc. Note: Work in continuous rounds. Do not join or turn at the end of each round. Place a stitch marker to indicate the end of a round and move the marker up as each round is completed. Round 2: *Sc in next sc, ch 1; repeat from * around—8 sc and 8 ch-1 spaces. Round 3: Sc in first sc, ch 1, sc in next ch-1 space, *ch 1, sc in next sc, ch 1, sc in next ch-1 space; repeat from * around, ch 1—16 sc and 16 ch-1 spaces. Round 4: Skip first sc, *[sc in next ch-1 space, ch 1] 4 times, sc in next sc, ch 1 (increase made); repeat from * 2 more times, [sc in next ch-1 space, ch 1] 4 times—19 sc and 19 ch-1 spaces. Round 5: Skip first sc, sc in next ch-1 space, ch 1, *[Sc in next ch-1 space, ch 1] 5 times, sc in next sc, ch 1; repeat from * 2 more times, [sc in next ch-1 space, ch 1] 3 times—22 sc and 22 ch-1 spaces. Round 6: Skip first sc, *[sc in next ch-1 space, ch 1] 7 times, sc in next sc, ch 1; repeat from * 2 more times, sc in next ch-1 space, ch 1—25 sc and 25 ch-1 spaces. Round 7: Skip first sc, *[sc in next ch-1 space, ch 1] 11 times, sc in next sc, ch 1; repeat from * 1 more time, [sc in next ch-1 space, ch 1] 3 times—27 sc and 27 ch-1 spaces. Round 8: Skip first sc, *sc in next ch-1 space, ch 1; repeat from * around—27 sc and 27 ch-1 spaces. Repeat Round 8 until hat measures 9 1/2"/24 cm from center of crown. Fasten off. Beginning at center of bobble, with smaller hook, ch 4, leaving a 4"/10 cm tail for tying bobble to hat. Fasten off leaving a 4"/10 cm tail for tying bobble to hat. Roll up 2"/5cm of brim. Using yarn needle and D, work a French Knot at the center of each bobble. Stuff each bobble lightly with polyester fiberfill. Arrange bobbles, evenly spaced around brim. Use the yarn tails to tie the bobbles to the hat. Weave the tails back into the bobbles to hide. That is really fun and cute! I just love it! Very cool, perfect gift for a little girl.